Baton Rouge, LA: Erickson Educational Foundation, 1973. Original wraps. Fine. 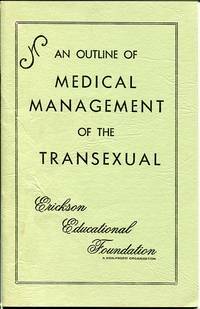 A pristine copy of this uncommon 1973 instructional booklet on transexual therapy. (Especially unusual given the date and location of publication). Clrean and Fine in its stapled red wrappers. Octavo, 37 pgs. Baton Rouge, Louisiana: Erickson Educational Foundation, 1973. Original wraps. Fine. 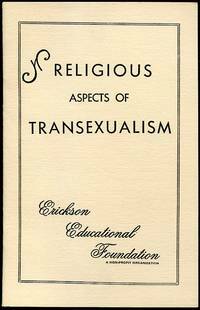 Very uncommon 1973 booklet on the religious repurcussions of transsexualism. (Especially unusual given the early date and location of publication). 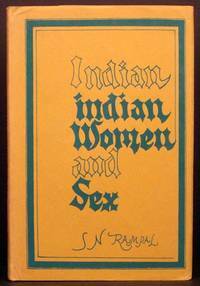 A pristine copy: bright and Fine in its stapled printed wrappers. Octavo, 13 pgs. Baton Rouge, LA: Erickson Educational Foundation, 1973. Original wraps. Near Fine. 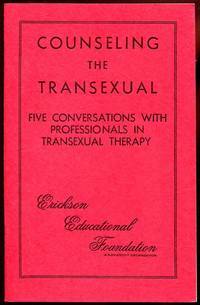 Very uncommon 1973 instructional booklet for the transexual. (Especially unusual given the date and location of publication). A very sharp copy to boot: bright and Near Fine in its stapled printed wrappers. Octavo, 20 pgs. Baton Rouge, LA: Erickson Educational Foundation, 1973. Original wraps. Fine. 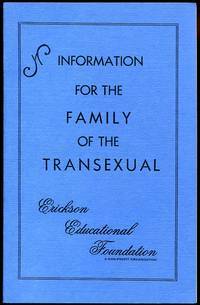 A pristine copy of the 1973 1st (and undoubtedly only) edition of this very uncommon instructional booklet for the transsexual. (Especially unusual given the early date and location of publication). Bright and Fine in its stapled printed wrappers. Octavo, 16 pgs.